Endovascular aneurysm repair (EVAR) is associated with decreased periprocedural mortality, complications, and length of hospital stay compared to open repair. Endoleaks can occur in 20–25% of patients after EVAR, with type II endoleaks being the most common. They commonly occur from retrograde collateral blood flow into the aneurysm sac, typically from a lumbar artery or the inferior mesenteric artery (IMA). Type II endoleaks are only treated if there is evidence of aneurysm growth (generally >5 mm). There are multiple approaches to the management of these endoleaks, including transarterial, translumbar, transcaval, and surgical approaches. 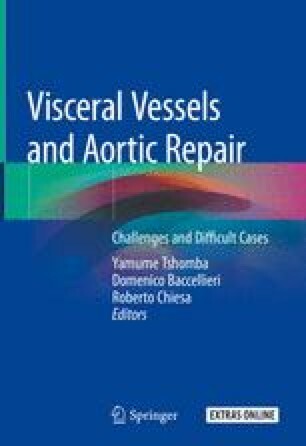 This chapter will look at the endovascular treatments, analyzing techniques, results, and modern tools available.